Here we have comprised information about an unconventional career in the hospitality industry. i.e Bartending. Bartending as a career falls under the food and beverage department of hospitality and tourism industry. Even though bartending was omnipresent in the hotel management field, it gained much popularity as a career after the Hollywood movie cocktail starring Tom Cruise was released. 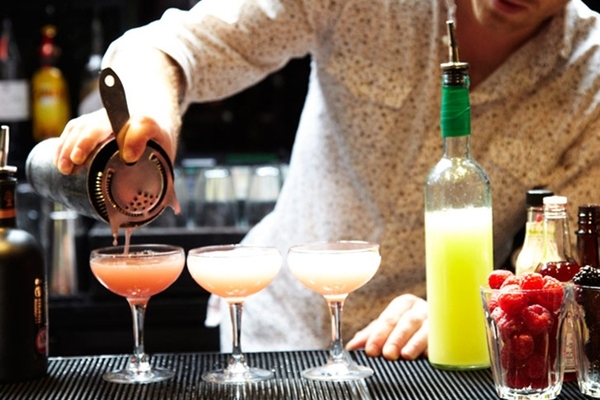 People who serve drinks or cocktails as per the taste and requirement of customers or guests in bars, restaurants, hotels and clubs are bartenders or mixologists. Bartenders who work in full service bars where drinks are served only to diners at tables, may not have direct contact with customers. They just fill the drink orders taken by waiters. But majority may work in establishments that take direct order and have direct contact with customers. To become a bartender you need to be genuinely hospitable and have a liking for hospitality industry. As bartenders play an important role in attracting customers, they need to develop a rapport with guests, be friendly, humorous and attentive to guests. With the pub and cocktail culture picking up among youth, career as a bartender is slowly gaining demand in India. Though aspirants may have been attracted by the cocktail demonstration or the show put on by the bartenders one need to realise that a lot of responsibilities entail the job of a bartender. The work includes creating and demonstrating cocktails and mocktails using alcoholic and non-alcoholic beverages/syrups and much more. The job of a bartender is not only to serve drinks but also to take care of all that is going on in and around the bar. From checking for cleanliness in the bar to getting stocks replenished, checking sales summary, and briefing the bar team on any specials, offers and new arrivals, he does it all. In small restaurants/ bars they even collect payments, operate the cash register, at times even serve food and clean up after customers have left. One of the most important part of bartending, like cooking, is consistency. Bartenders must know a wide range of drink recipes and be able to mix drinks accurately, quickly, and without waste. Some establishments, especially large and busy establishments with many customers, use equipment that automatically measures, pours, and mixes drinks at the push of a button. In this case they must be familiar with the ingredients for special drink requests not handled by automatic machines. Before entering into this area you must be willing to commit late nights, weekends, even holidays to work. Keeping abreast with new techniques and trends is also a must. Bartending has always been a male-oriented business. This is a fact not only India but abroad as well, though the percentage of female bartenders definitely is much more in the west. There is no specific formal degree or qualification required for this career. However, some of them enter this career after completing a course in Hotel management or a certification course in Bartending. Now due to demand in this field those students in hotel management and hospitality field are taking short term courses in bartending as an add on to their skill. Many bartenders are promoted from other jobs at the food service establishments in which they work and receive on-the-job training. Those who wish to work in reputed establishments need vocational training in bartending. There are many institutes in India as well as abroad offering training in bartending. Earlier bartending was taught as a subsidiary subject along with Hotel management course. Now there are certificate courses available in bartending. These courses comprises of essence of mixology, licensing laws and regulations, cocktail recipes, bar ethics- attire and conduct, basics of wine or beer, pricing, billing, glasses used and on how to stock a bar. The lengths of programs vary, but most courses last a few months. Some of the bartending schools help candidates find placements as well. Minimum age to become a bartender is 21, though people above 25 are usually preferred. A person who is creative in flavor making and having a keen knowledge of mixology can succeed in this industry. A bartender must be able to work on his own as well as along with a team. They should have good customer service skills to ensure business. Many times they need to develop a rapport with guests, for which good communication skill and a pleasant, outgoing personality is needed. As they play an important role in attracting customers, Bartenders should be friendly, tactful, and attentive when dealing with customers. Bartenders work on their feet for long periods of time for which good physical stamina is required. They should have speed and a presence of mind to prepare a drink at a moments notice. It also requires mental ability as you need to remember a lot of cocktail combination's. They are also expected to remember the faces of guests along with their drink preferences. Before entering into this area you must be willing to commit late nights, weekends, even holidays to work. Keeping abreast with new techniques and trends is also a must. Job prospects for this career is now much more than earlier in India with the mushrooming of hotels, resorts and night clubs. Bartending jobs are available both as part time and full time. In fact, Bartending is one of the best part-time jobs available to college students. Strong competition is expected for bartending jobs in popular restaurants and fine-dining establishments. Those who have graduated from bartending schools and those with previous work experience and excellent customer-service skills will have the best job prospects. There are various career options for a bartender. From bars, night clubs/country clubs, resorts, hotels, cafes to fine dining restaurants, airlines, cruise lines they can choose their preferred working environment to suite their personality and bartending skills. They have an option to work in all service bars where they just fill orders and don't have to directly interact with customers. They can also do freelancing without being tied down to a single restaurant, hotel or nightclub. Banquet functions almost always call for a bartender to cater to events like weddings, baby/bridal showers, communions, parties etc. Once they have gained experience in bartending, bartenders can start their own outdoor bartending business. They can also choose to work with leading alcohol brands for testing and training. They can enter into tie up with an event management team. Among these jobs, the most alluring one is the life on cruise lines where a bartender serves on passenger cruise ships. Beverage consultant or trainer are other options available. After years of experience in the field career advancement is possible. They advance to supervisory jobs, such as dining room supervisor, maitre d’, assistant manager, or restaurant general manager. A few bartenders open their own bars. Earnings vary greatly, depending on the type of establishment. Further wages vary from country to country, however in most cases bartender's tips are higher than wages. A trainee bartender can earn approximately Rs.3,500 to Rs.6,000 a month, whereas a main bartender can take in Rs.10,000 to Rs.20,000, exclusive of daily tips. Remuneration in this field in much higher in 5 star hotels. Those Bartenders at passenger cruise ships get a lucrative package. An efficient freelance bartenders earnings can go up to Rs.10,000 per night. There are many institutes in India as well as abroad offering training in bartending. To get the list of institutes in India, click on the course name.